The idiom saved by the bell expresses the idea that someone or something is rescued from a dire outcome by a timely occurrence, generally speaking, at the last possible moment, i.e., in the nick of time. A close shave. Saved by the bell originated from attempts starting in mid-19th century England to more fully develop and codify rules governing boxing matches. … and in just two panels illustrates what the expression saved by the bell was originally all about, and why the phrase still resonates even though the sport of boxing has become increasingly unpopular. Most familiar, as well as most significant of these efforts to regulate boxing were the Marquess of Queensberry rules, which among other things specified that fight matches consist of three-minute rounds, each separated by one-minute breaks. 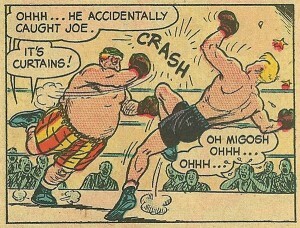 In the course of a round, a boxer who receives a knockout blow is said to be down for the count. 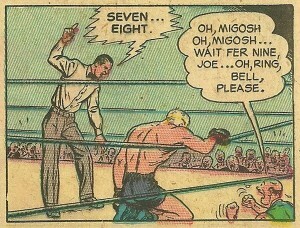 If the fighter is unable to regain his footing during the count, which lasts 10 seconds, he or she is declared “out” by the referee, thereby losing the match. However, if the ringside bell signaling the end of the round sounds before the count is over, the fighter is said to be saved by the bell. According to the good people at The Phrase Finder, which is pretty much the gold standard for information regarding idioms, the expression saved by the bell was probably in use by the later part of the 1800s, with its earliest print appearance occurring in 1893 in the Massachusetts newspaper, The Fitchburg Daily Sentinel, in relation to a prizefight. Soon thereafter, saved by the bell started being used to describe just about any kind of close call. Two other origin stories for saved by the bell continue to surface on the web, one tale colorful (and creepy! ), the other related to everyone’s school-day memories. While both have an air of what Steve Colbert refers to as “truthiness” about them, both accounts fit into the category of folk etymology, or something like that. 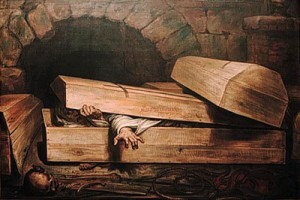 Inhumation précipitée, painted in 1854 by Antoine Joseph Wiertz depicts a cholera victim awakening after being placed in a coffin, and can be viewed as illustration of “taphephobia” – the fear of being buried alive. Notables such as Lord Chesterfield, George Washington and Frederic Chopin all laid claim to this condition, probably in light of the poor practice of medicine at the time. The patented “Improved Burial Case” by Franz Vester of Newark, New Jersey, on August 25, 1868. Note the presence of a bell to be rung if said occupant wakes up to a shocking reality. Each description of these caskets includes a number of features, including a window to allow monitoring the presumed dead person for signs of life, a tube for providing fresh air, and most importantly, some sort of device that would enable an entombed victim to ring a rescue bell posted above the gravesite. But while the Internet is full of illustrations and photos of various fail-safe “corpse containers” there are no references – nada – about any of these types of coffins actually saving anyone. Also, there seems to be no accounts of anyone using the idiom prior to those related to the rules of professional boxing. 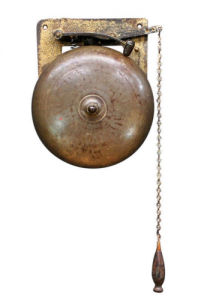 One of the most shared mid- and upper-school experiences is the sound of a bell, chime or buzzer to signal the beginning and end of a school day, and the division of that day into equal time periods for different classes, lunch times, and study halls. 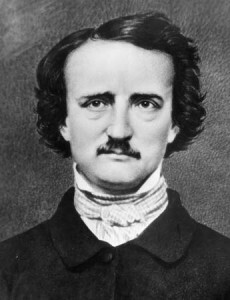 Edgar Allen Poe (1809 – 1849), America’s first mystery and spooky story writer. Many former students recall something like the following scenario. Your American Literature assignment was to read Edgar Allan Poe’s story “The Premature Burial,” which of course you totally forgot to do. So when Mrs. Gruber awakens you with a question, your mind’s a blank. You are trapped. Like a rat. And then, the bell, signifying the end of class, rings (with apologies to Poe’s poem, “The Bells”), and Am. Lit class is over. Saved by the bell! But putting aside any empathy one might have with sleepy students and ringing bells, again, all “origin” references for saved by the bell point first to its use in connection with boxing terminology. Case closed. And this post is closed. Any discussion about the idiom saved by the bell would be incomplete without mentioning the classic classroom TV comedy series shown below. With mom jeans (and dad jeans) and big hair for all, Saved by the Bell was an NBC Saturday morning sitcom that ran from 1989 – 1993. Cast featured Tiffani Thiessen, Mario Lopez, Lark Voorhies, Elizabeth Berkley, and Dustin Diamond. After the series ended, all of the above went on to acting careers of varying degrees of fame/notoriety. This entry was posted on Thursday, March 31st, 2016 at 3:00 pmand is filed under . You can follow any responses to this entry through the RSS 2.0 feed. You can leave a response, or trackback from your own site.